These beautiful watercolor mason jars are a simple and inexpensive way to decorate outdoors or indoors for spring and summer. You cold make up an entire case of mason jars (12) for around $10.00 in materials. They make a pretty vase for real or silk flowers, a hanging lantern with a tea light inside, or even just sitting out in a row for color. I have done these before, painted on the inside but then you cant use them to hold water, or light a candle inside. I am planning on doing an entire case to place all around my patio and front porch. You can make these in any color scheme to compliment your interior or exterior furniture , or to match your party decorations. This set was made using neon food coloring. 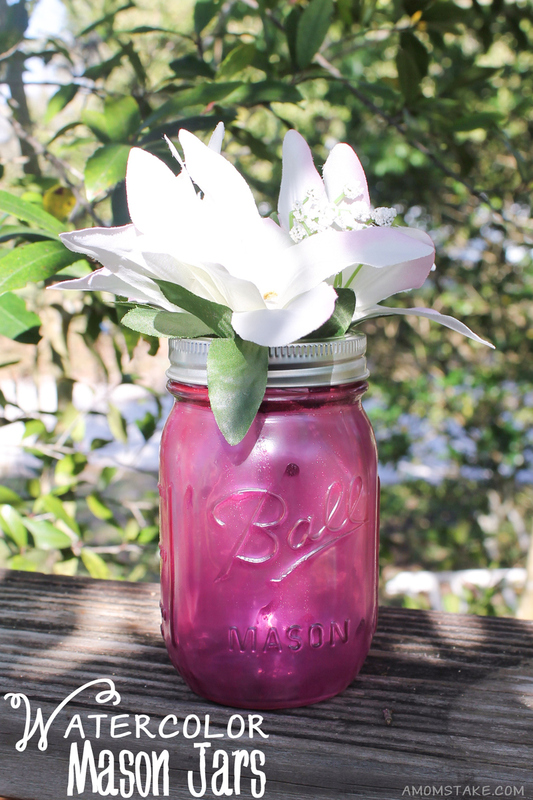 I hope you enjoy making your own water colored mason jars! Mix 1 Tbsp. of glue with ½ tsp. Water and 8-10 drops of food coloring for each jar. 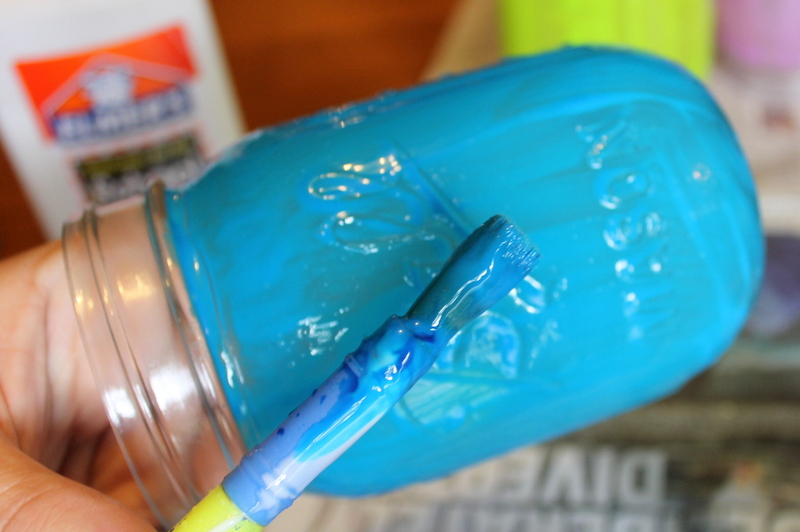 You will want your glue mixture to be very dark, as it dries the color lightens up quite a bit. 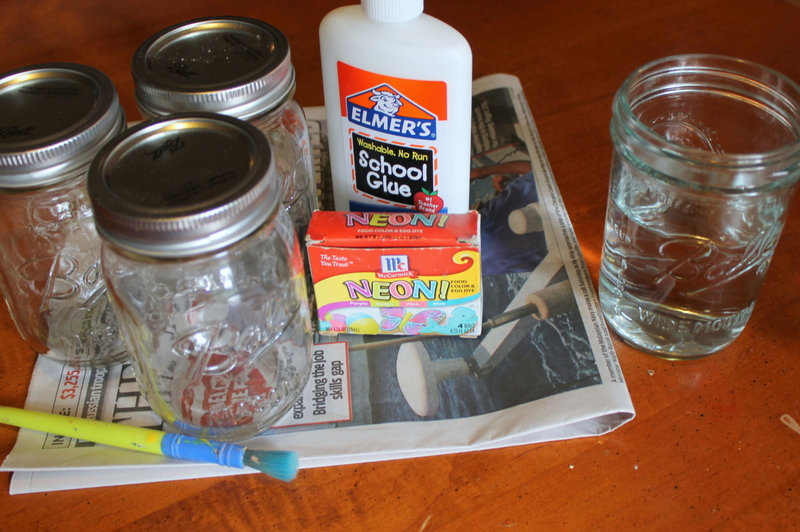 “Paint” glue mixture on each jar thickly up to the bottom of jar rim, including the bottom. Brush lightly back over jar, trying to eliminate streaks and drips. Place jars on a parchment lined baking sheet, upside down. Bake in oven for 20 minutes, turn jars over , turn off oven and let them remain in hot oven for at least and additional 10 minutes. If your jars are still streaky, leaving them in oven for a longer amount of time should clear or lighten up your streaks. Allow jars to cool completely. 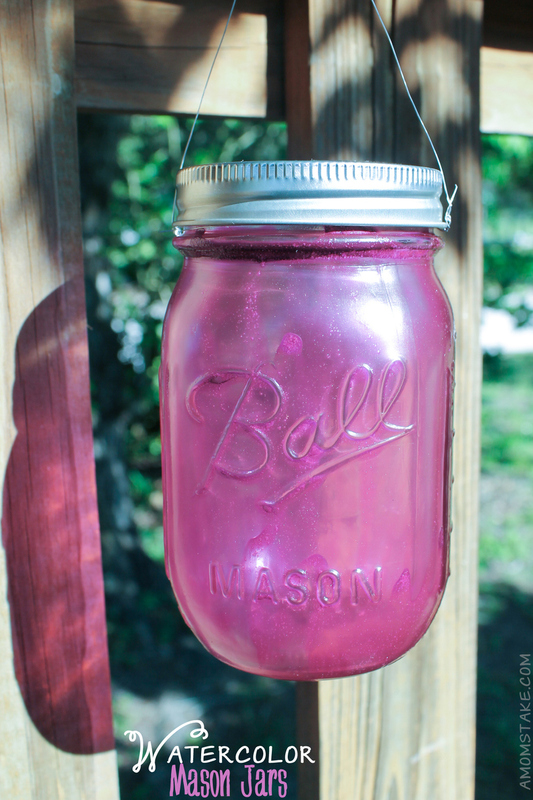 To make them durable for outdoors- once jars have cooled , spray with 2-3 coats of clear coat spray. Screw on a mason jar rim securely to add a finished touch. You can now add some fresh or fake flowers and use the jar as a standing decoration, or keep going to make a hanging jar. 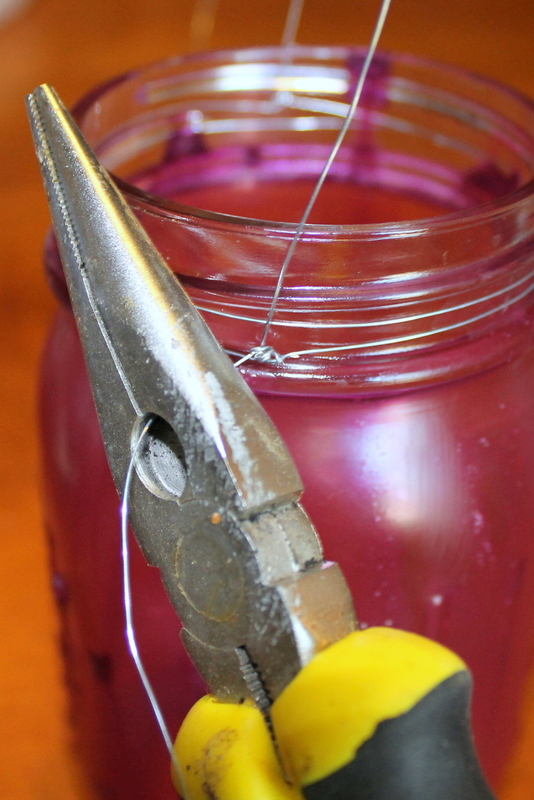 To create a hanger for your jar, wrap in wire and twist ends tightly using a pair of needle nosed pliers( I used jewelry wire since I already had that on hand) then snip off excess wire. Create a loop handle for hanging by measuring the length you want ( I just eyeballed mine) wrap one end around the wire band you made and twist tightly, cut off excess. Stretch wire over in an arch and secure to the other side, twist and cut off excess. In the end, you will have beautiful watercolor mason jars that will spruce up your home, inside or out, for spring! You could even try adding a tea light inside for backyard lighting for a party. I’m planning to string a whole set around my back porch because I love how they turned out. They add so much color, especially when the light shines through the jars. What color will you paint your Watercolor Mason Jars? 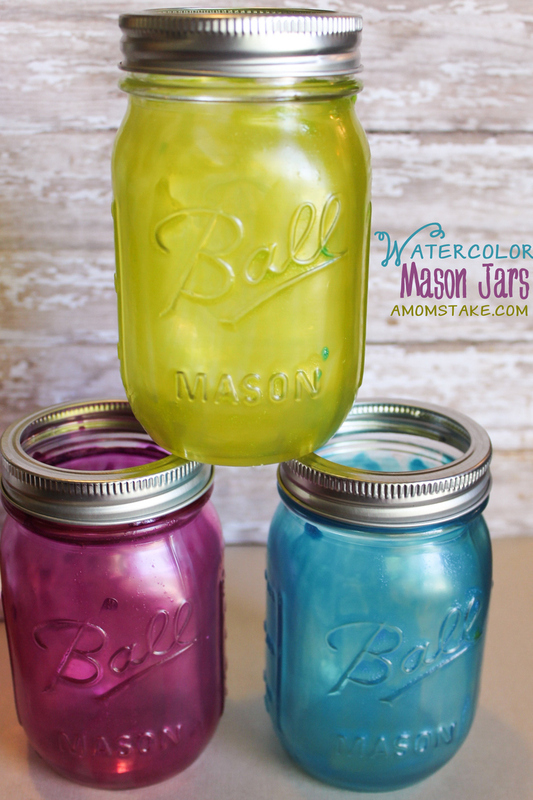 I’ve been wondering how to color mason/ball jars! Now I know 🙂 Thanks, Janel… I’m headed to Pinterest, just gotta pin this!